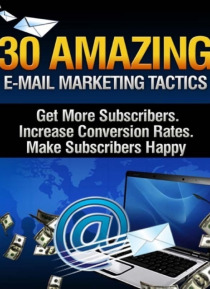 "e;Instantly Get Access To 30 Amazing and Easy To Implement E-Mail Marketing Tactics..."e; Here's a quick look at just some of the tactics. The guide elaborates further on how to do it... E-Mail Marketing Tactic #1: Announce Big Sales, E-Mail Marketing Tactic #2: Use Strong Subject Lines, E-Mail Marketing Tactic #3: Make the Call to Action Clear, E-Mail Marketing Tactic #4: Use Social Netw… orking to Your Advantage, E-Mail Marketing Tactic #5: Include Fun, Informative Content in Your Emails, E-Mail Marketing Tactic #6: Take Advantage of the Holidays, E-Mail Marketing Tactic #7: Avoid Spamming, E-Mail Marketing Tactic #8: Create Target Lists for Different Demographics, E-Mail Marketing Tactic #9: Keep the Quantity to a Minimum, E-Mail Marketing Tactic #10: Beauty Actually Does Matter, and Much More.. Just Imagine... 1. ou'll gain more subscribers so you can sell more of your products. 2. Feel safe knowing that you can simply send out an email whenever you need quick cash..